For pioneering Italian Chef, Alessandro Borghese, cooking is the new rock ‘n’ roll. A colourful, fast-paced and dynamic industry with universal appeal where a flawless performance is essential to success. With a focus on big, bold flavours and natural ingredients, simply prepared, Chef Borghese has become a culinary superstar, not just in his native Italy but on the international stage.When it came to fitting the interiors of his hotly anticipated restaurant “Alessandro Borghese – Il lusso della semplicità” (The Luxury of Simplicity), Milan, he needed to find materials which encapsulated his inventive approach and reflected his flamboyant personality; Neolith stepped into the spotlight. A desire for originality, a fascination of the Sintered Stone production process and an admiration for the surface’s versatility drew Borghese irresistibly to Neolith. In particular, he was impressed by its adaptability and how it can seamlessly integrate within a specific environment, adding character and individuality. Alessandro liked Neolith (and the large variety of colours and patterns) so much he used it throughout the restaurant. An ingenious mix of tones and contrasts including woods (Neolith La Boheme), marbles (Neolith Carrara B01), metals (Neolith Iron Corten) and granites (Neolith Nero Zimbabwe) were applied within the venue to evoke the atmosphere of the golden age of the transatlantic cruise liner. Neolith Calacatta Silk was also specified for the bar worktops, a finish fast becoming a go-to choice for professional chefs for its aesthetics as much as its practicality. 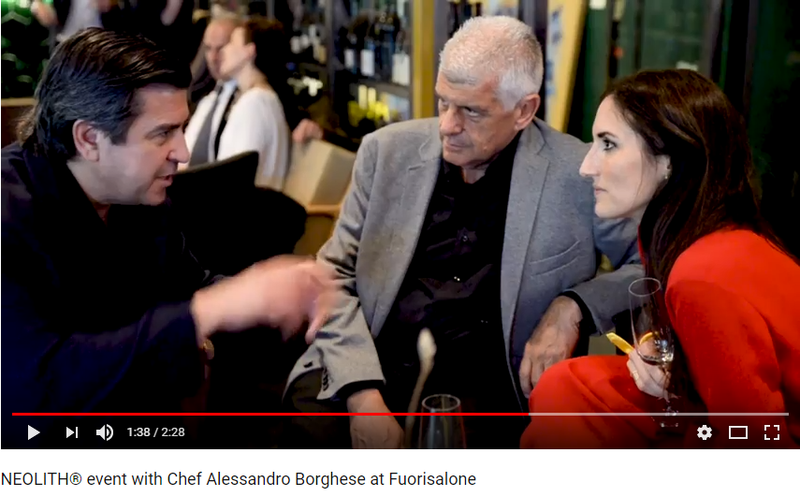 Chef Borghese highlights the newly-discovered freedom of being able to plate his adventurous concepts and culinary inventions straight onto the surface. He compares it to the craft of an artist. ‘If I was a painter’ he muses, ‘Neolith would be my canvas’. Furthermore, concept becomes reality as the restaurant also uses smaller, bespoke-cut pieces of Neolith as plates for tapas-style dishes. The small plates, which combine delicate food on an elegant backdrop are a real hit amongst Alessandro Borghese – Il lusso della semplicità’s diners. At its heart, Chef Borghese wants his restaurant to embody the cosmopolitan metropolis of Milan. It’s a destination with a warm, international atmosphere which bills delicious, honest food as the central performer alongside strong support from Neolith surfaces. Click on the video below featuring our Marble Trend’s very own Ernie Luchetta at Salone Del Mobile 2018 Event!